Andrea Warner follows up her fantastic debut, We Oughta Know: How Four Women Ruled the ’90s and Changed Canadian Music, with Buffy Sainte-Marie: The Authorized Biography, and here she talks to us about the challenges of biography, chronology, and the experience of working with a music legend. 49th Shelf: “My God, how does one write a Biography?” wrote Virginia Woolf once, and she’s just one of many writers who’ve struggled with the genre. I imagine it’s a bit easier, however, when you’ve got the person you’re writing about telling stories down the telephone and reading over your manuscript, offering clarity and answering questions. 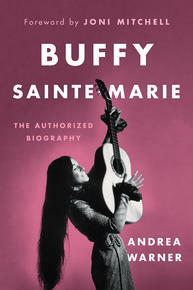 Do you think you could have written this book without Buffy Sainte-Marie being a partner in the project? Would you have wanted to? Andrea Warner: I wouldn’t have done this without Buffy’s consent and support. Her voice is essential and so powerful. This is her life story and she doesn’t really need me to do tell it. She’s Buffy Sainte-Marie, she’s an amazing storyteller. But what I can do as a writer and as a feminist music critic who has spent years writing about Buffy’s music and the music business is provide a framework for her story and contextualize her journey so far. She’s Buffy Sainte-Marie, she’s an amazing storyteller. But what I can do as a writer and as a feminist music critic who has spent years writing about Buffy’s music and the music business is provide a framework for her story and contextualize her journey so far. I had no interest in an unauthorized biography. As a white settler who is also feminist, able-bodied, and middle class, I have a lot of privileges, and it’s not enough for me to just be aware of them, I have to actively work to dismantle those systems of oppression, erasure, and marginalization from which I benefit. My friend, Hannah McGregor, is a writer (she is the co-editor of the new anthology Refuse), professor, and podcaster. She interviewed me for one of her great podcasts called Secret Feminist Agenda, and she called what I do “consent-based journalism” and I love that so much. It’s absolutely what I strive to do and I’m so grateful to Hannah for coining that term and using it to describe my work. 49th Shelf: I’m curious about how you came to organize the book. Chronology itself seems straightforward, but lives are messy, and themes and eras overlap. Were there stops and starts before you arrived at your framework? What was that process like? Andrew Warner: One of the first things that Buffy said to me was, “I’m not much of a linear thinker.” And this was kind of a soft warning. Her mind jumps around, and she goes backwards and forwards in time a lot, but I love it. I love following the sudden jolts, and she almost always comes back to a point, too, even if she left it behind four thoughts ago. It’s a very creative thought process, a vibrant and lively one. So I approached the shape of the book through song titles, and I thought that would be the best way to provide a framework that wasn’t strictly linear, but loosely. So, the first draft to Greystone was not as chronological as they expected, and my patient angel of an editor, Jennifer Croll, was like, "So, this isn’t quite what I thought I’d be getting." She was really nice about it, I was a little panicked and devastated, but when I saw what she was suggesting with her very thorough and significant structural edits, I understood immediately where I’d sort of gone rogue and why her edits were going to make the book better. I had just two weeks to do this massive structural rewrite to keep the book on schedule, but Jen’s notes and support made it possible. I also did nothing else except work on the book for 16 hours a day, basically. But I’m so proud of it. It was absolutely worth it. 49th Shelf: It was interesting to be reading this book during a literary season when books about women and anger are very much on trend. And I love that trend, actually, but Sainte-Marie’s perspective adds an interesting counterpoint. She says, “I don’t pretend to be a warrior…I tend to be patient… Some people will argue that I’m not angry enough…and they might have a point.” What do you think readers and activists can learn from this perspective? Andrea Warner: Patience is hope, and I feel like Buffy models it so beautifully. She gets angry, she says that, but she knows that for herself, when she’s doing something from a place of anger, it distorts her message, and it limits the efficacy of her message. Anger is very natural and normal and valid. And Buffy says in the book that she gets angry, but she is always thinking about how to use that anger effectively. But I also think this book shows that there’s no one way to stand up for yourself, for your community, and for equity and justice. Buffy talks about looking for people on the ground who are doing the work and deferring to them, asking what they need, and diverting the spotlight. Activism without ego is essential to making change. This book shows that there’s no one way to stand up for yourself, for your community, and for equity and justice. 49th Shelf: Your book is full of fascinating Buffy facts—I’d already learned that as an actor on Sesame Street, she was the first person to breastfeed on television…but even more mind-blowing (I thought) was that she was initially the only grown-up on the show who could see Mr. Snuffleupagus. That’s incredible! The book is so full of rich details like this, and also about her long relationship with technology. What was your favourite bit of Buffy trivia that you discovered in your research? Andrea Warner: I loved the story of how she Indigenized The Virginian in 1968. Fifty years ago, she was asked to take a guest-starring role on this television show, a Western, and she said that if they wanted to have her, they had to 1) make her part richer and not just a stereotypical “Indian princess” and 2) they had to hire actual Indigenous actors to play the roles of every Indigenous person. This, at the time, was unheard of. And she just didn’t care if she was on TV at all, she saw an opportunity to make the show better and more authentic, as well as introduce these studio executives to this whole world they’d never even considered. And they did it! They ended up hiring around 40 Indigenous actors to play those roles. It’s a groundbreaking moment, but it rarely ever gets talked about. 49th Shelf: I also loved the way you wrote about her music. Can you describe the experience of trying to fit such a long and varied musical career in your narrative? What are the through-lines in Buffy’s musical story? Andrea Warner: Thank you so much. I love writing about Buffy’s music, because I feel like I’m constantly learning about the world and her life in every song, be it the lyrical content or the arrangements or the instrumentation or a neat trick with a melody or even just how the songs differ in her various re-recordings of them. I feel like she’s been mapping hope in her music since the very beginning, that’s the biggest through-line, from “Universal Soldier” right to her most recent singles, “You’ve Got to Run” and “the War Racket.” Buffy’s hope is a radical act, and it’s at the heart of her songbook and the very foundation of her humanity. Buffy’s hope is a radical act, and it’s at the heart of her songbook and the very foundation of her humanity. 49thShelf: If you were crafting a Buffy Sainte-Marie playlist, what top five tracks would you pick? Andrea Warner: Oooh, this is tough. I like to offer up a real sampler of her innovation, her creativity, and her power as a vocalist and lyricist. I’m going to cheat a bit because I’m going to endorse multiple versions of the same song sometimes, please indulge me. "Until It’s Time for You to Go"
Folk hero. Songwriter icon. Living legend. Buffy Sainte-Marie is all of these things and more. In this, Sainte-Marie’s first and only authorized biography, music critic Andrea Warner draws from more than sixty hours of exclusive interviews to offer a powerful, intimate look at the life of the beloved artist and everything that she has accomplished in her 77years (and counting).